I've been on a major skincare/beauty binge lately, which you may have noticed with a few of my recent posts. A few months back I brought you The Best Lip Balms, which featured favorite lip balm picks from my friends and me. I thought it would be fun to expand on that post and bring you beauty recommendations not only from me, but from my most stylish and beauty savvy friends. Today I have for you tried and true cleanser recommendations. I think that cleansing the skin is one of the most important steps in your skincare routine after moisturizing. So here I have several products to choose from that my friends or I use consistently and love enough to recommend to you! This is my absolute favorite cleanser that I have ever used, and that says a lot because I have tried about a million different cleansers. I can honestly say that my skin has changed for the better since I started using this. It is a gentle gel cleanser that contains natural Alpha Hydroxy Acids to chemically exfoliate skin and help to breakdown anything that might be clogging your pores. From my experience it really helps to keeps blemishes and blackheads at bay without drying out my skin. This is my go-to cleanser when my skin is feeling a little dry and is need of some gentle exfoliation. It uses natural ingredients like kaolin clay and lavender oil to deep clean and soothe skin. You can read a review post I have about this amazing product here. This is a cleanser has a cult following of skin care gurus, celebrities, beauty magazines, and more; I can't even count the number of people I know who use and love it! It's great for when your skin is experiencing a dry spell or for an everyday mild cleanser. I like to use this to wash my face in the morning to gently clean it without stripping it of any natural oils and then I use the Mario Badescu cleanser at night to remove all of the impurities my skin has built up throughout the day. I know it may seem an odd thing to list as a cleanser, but honey is my favorite way to naturally cleanse my skin. Honey is moisturizing and filled with antibacterial properties, which allows it to help clear up skin without drying it out. If you've been on here for a while you know I love finding natural alternatives to beauty products and this is definitely one of my favorite. I've been using regular honey, but you're supposed to use raw honey as it has more antibacterial properties so I will be buying raw the next time around. Learn more about washing with honey by reading Skin Care 101: Cleansers under the natural category. The picks here are from my friends that I would turn to for beauty recommendations. When I asked around everyone had a cleanser that they loved andhighly recommended. 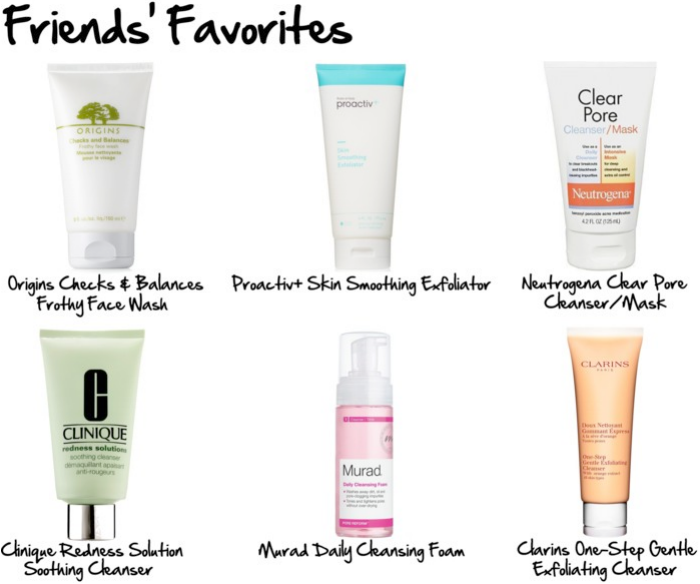 So here are the cleansers that are my friends' favorites! Lia loves a good facial cleanser and highly recommend this one by Origins. She says she loves that it has a creamy feel, but still lathers nicely. It's also a top seller on the Origins website! Angela's skin is always blemish free thanks to her favorite Proactiv cleanser. She says that it "makes my skin smooth and helps my makeup go on evenly!" My sister and I both love this cleanser. It powerfully cleans your skin to remove anything that may cause blemishes and does it with a nice cooling feeling. It also works wonders as a mask to get an even deeper clean. Shannon suffers from Rosacea and loves how this cleanser helps to sooth it. This line is made for people with Rosacea and she says "it's really gentle and has probiotics in it!" She loves the line so much that she uses the moisturizer too. Amira seriously has the most gorgeous skin, it is literally flawless! She uses this cleanser and recommends it to keep your skin looking great. Fellow blogger Jordan loves this cleanser and highly recommends it. She says "it's exfoliating so my skin feels super smooth and it really clears my pores." All of the cleansers here have been tested and are worth looking in to. Like I mention in this post, I always like having a few different cleansers in my beauty rotation to address any skin issues that I am having. So if you're looking for a new cleanser or having an issue with your skin you should definitely check out what I have listed here. 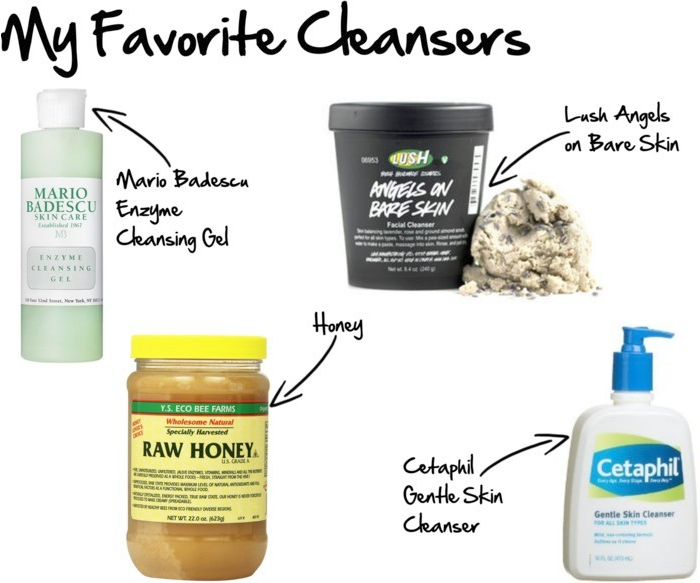 Have you used any of the cleansers here? What is your favorite cleanser? Today I'm linking up with #HowISpring, Manic Monday, MIMM, Let it Shine, Mingle Monday, and Weekending. We use Cetaphil and LOVE it. I'm interested in the Lush one though--I love their creams but have never tried the face wash! Great recs! I've never tried that one from Lush, but I've tried others from there and loved them! BeautiControl makes a great cleanser specific for your skin (oily/dry/combo). It is AWESOME and has been the only thing to clear up my acne! !